Since the dawn of the computer age our computers have beeped or clicked at us. These beeps and clicks were generally for the purpose of warning of an imminent crash but a few clever people thought it was a good idea to put them to work in a rhythm and musical computing was born. The obvious place for these tunes was the world of computer and video games. Over time the chips that controlled the beeps grew in complexity and so the tunes did too until one day the CD-ROM was invented and suddenly it all stopped. CDs brought with them CD quality pre-recorded music and so there was no longer any need for musical chips. This page is dedicated to their memory. Now, however, chip music is making a huge comeback on those pocket sized beeping devices we call the mobile phone. Mobile tunesmiths could benefit from looking back to the old game tunes for inspiration. All music files are downloadable and they're all tiny in size but you'll need the appropriate player program as detailed below. Some files may also require unzipping. In the early days of the Spectrum all we heard was a sort of clicking and droning. Although some great music came from it, it wasn't until the addition of the AY chip to the 128k Spectrum range that Speccy music really took off. This was the same chip that graced the Amstrad CPC but the Spectrum still had its older music chip as well for compatibility reasons and it was this combination that made all the difference. With the AY chip producing the tune, the old chip was turned into a drum machine and this symbiosis produced some of the most beautiful music on any of the 8-bit machines. 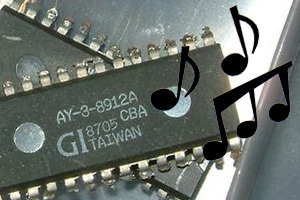 The AY chip went on to feature in the Atari ST which was the only choice for home synth fanatics of the late eighties. Robocop - This is what inspired me to write this section. The main opening theme from the ZX Spectrum 128k version of Robocop from 1988. This really shows what can be done with the wonderful AY music chip. The tune has since been used in TV commercials. Robocop was the best selling game on the 8-bit machines, shame it was rubbish. If anyone can turn this into a mobile ring tone I'd love to hear from you. KwikSnax - This is one of the best AY tunes of all. It features at the opening of the game where it is accompanied by an animation of Dizzy and all his friends playing the tune live on stage! Your going to need AY Emulator to play this one, MicroSpeccy will not do see below. Wizball - Wow I just discovered this one now whilst finding stuff to put here, it's ace! Arkanoid - I played this game for hours and this music still haunts me. This one only uses the 48k beeber. Auf Wiedersehen Monty - Sorry, this is much better than the C64 version. Has a kind of Duran Duran feel. BallBreaker - Great tune from this 3D Arkanoid clone. Batman the Movie - This one really takes its time but once it kicks in it's unforgettable. Cybernoid - Fantastic game, fantastic tune. Magic Land Dizzy - The Code Masters really took their time over the music for the later Dizzy games and it really shows here. Equinox - Never heard this until today but it's great. Future Games & Zanthrax - Just listen to what the plain old 48k Speccy beeper could do before AY. Short Circuit - This was a terrible film licence, but Ocean had some of the best game musicians working for them at the time and here it really paid off. Spellbound - True genius (and far better than on the C64). Tai Pan - A taste of the orient. Target Renegade - Doesn't exactly fit the game but wonderful all the same. Project AY is an archive of Speccy tunes with advice on players. The 2 best AY players are here: Bulba, Microspeccy is nice and easy, AY Emulator is more complex but great. The Commodore 64 formed the main competition to the Spectrum and it had its fair share of great tunes. Its rendition of Robocop doesn't come close to the Speccy version though. Skytopia has a chart of the best C64 tunes. Sidplay2 is what you need to play your C64 SID files. Things were a lot more equal in the 16-bit era. Both the Genesis and the SNES had some great music. Xenon II Megablast - GYM This one was composed by legendary early nineties dance pioneers Bomb the Base. Skytopia has a chart of the best SNES tunes. Zophar's Domain has an archive of SNES tunes. Zophar's Domain is an archive of Megadrive/Genesis tunes. Chip-Tune have a huge selection of music files from all machines. If you are a Winamp fan you can get plugins for just about every game music format. Zophar's Domain is the best place to start.